Such wind generators differ from traditional offshore turbines, which are anchored to the seabed, in that the turbines are on floating platforms. They can be more easily moved and lessen the impact on the ocean floor, but most importantly they can be put in deeper waters, where there’s more wind and no one to object to the obstruction of views or impacts on the surf. Despite such advantages, the world’s first commercial floating wind farm – generating 30 MW – only opened last October, off the coast of Scotland. The Humboldt County project is set to come online in seven years, by which time it may not be the first such energy generator in the U.S.
Oceans Deeply spoke to Marshall about the project and why he hopes that it will advance the “commercialization of floating wind technology,” particularly along the West Coast. Oceans Deeply: You are currently buying much your energy from elsewhere. How does the cost of those imports compare to constructing this new floating wind farm? Matthew Marshall: We don’t have a final price yet. We’re not expecting it to be a lower cost option. The cheapest option is still going to be brown power: nonrenewable sources. In the state, the price of solar is coming way down, which is great, and there is actually a great abundance of it, which is a great problem to have. The nice part about offshore wind is that it has almost an inverse generation profile to solar, so if we’re really going to move the state to having 100 percent renewable sources – ultimately that’s the goal – we’re going to have to have a balanced portfolio of resources to do that. I think that offshore wind is really the biggest untapped opportunity. Oceans Deeply: Currently, the largest floating wind farm generates about 30 MW of power. RCEA’s project plans on developing up to 150 MW. Why the big leap? Marshall: The decision to shoot for that target has a couple of factors – one was that there are a number of other projects that are in the queue ahead of this, as far as the development timeline. We’ll see how things play out, but I wouldn’t expect that by the time this plays out, for this to be the largest project. There are a number of other projects in Europe and elsewhere that are moving forward. The other factor, as far as scaling up, is that the offshore turbines are getting much larger because there aren’t the space constraints of trying to move things around on road and trains. As that is scaling up, I think the expectation is that, by the time this project comes online in seven or so years, the industry-standard turbine is going to be closer to a 10 MWturbine, or maybe even 12. So, it might just be a 10- or 12-unit farm, but it would be a lot bigger than what a 10- or 12-turbine farm would have been five years ago, or even today, as far as the output. Oceans Deeply: The coast off Northern California has a lot of wind, but what makes Humboldt County a particularly good place for this? Marshall: I’m not going to claim to be an expert on the harbor requirements of offshore wind quite yet, but there are some basic factors, like is it deep enough, what’s the upland space available for staging and assembly? I think that our location is good, we’re a fairly underutilized port at the moment so there’s a lot of potential. I think that is something that really interests the community – having a port that is ready for some revitalization and some new activity, this industry is one that checks all the boxes of blue-collar jobs, port revitalization and renewable energy. Oceans Deeply: What environmental concerns apply to offshore turbines? One of the advantages of floating turbines is that, for the typical fixed-bottom offshore wind turbine they’re driving in foundations. That installation process can have a noise impact for whales, and so with a floating platform there is much less of that. Oceans Deeply: Are you hoping that this will be an example to follow? Marshall: We’re not going to be at the head of the curve, as far as the world – Europe’s going to be ahead of us and quite likely Asia as well. But certainly, for the West Coast, it’s looking increasingly probable that this might be the first floating project on the West Coast and it certainly could be the first floating project in the United States. That would be a groundbreaking opportunity, and so making sure that it’s done right and taking it one step at a time to make sure that there aren’t any unforeseen impacts. We’re just excited to be taking this first step in hopefully moving both this project forward for our community, but also hopefully in a way that’s helping to develop some innovation in the renewable energy sector that can really help us, and the state and the country get off of fossil fuels as soon as we can. 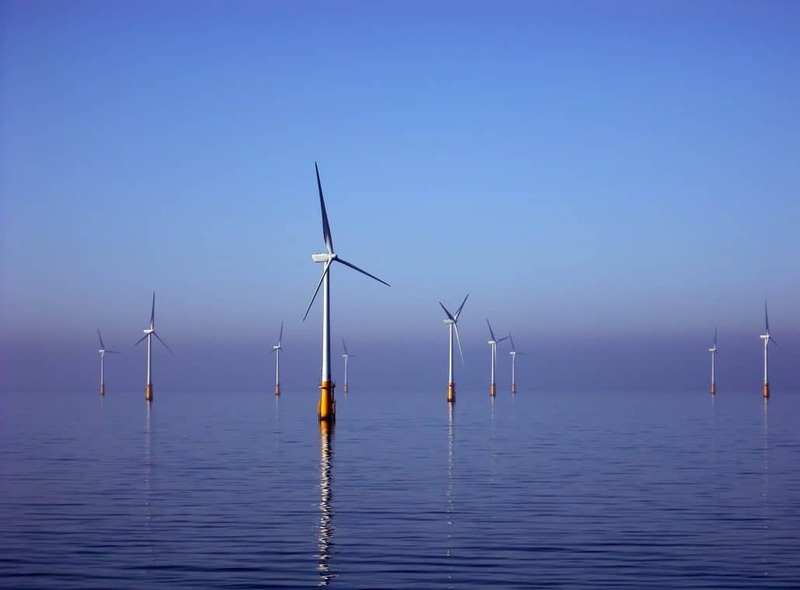 A Floating Offshore Wind Farm Is Coming to California, by Ian Evans, Oceans Deeply, April 13, 2018.